Salk Education Outreach participates in a number of different community forums apart from our main programs. 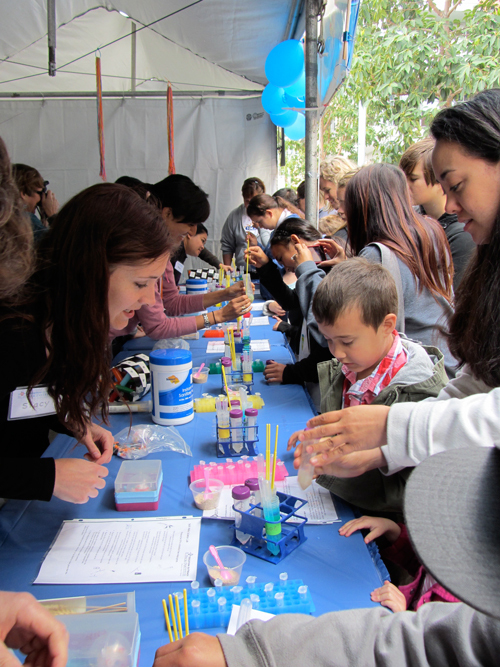 These include everything from activity stations at the Reuben H. Fleet Science Center several times a year, to Science Discovery days at local schools, to participation in the annual San Diego Science and Engineering Festival EXPO in Petco Park, to the Explore Salk spring event, to classes and lectures at the La Jolla/Riford Library, and more! Click HERE for a current calendar of upcoming events. Check back often, as new opportunities are always being added! Time commitments vary with the event but are generally only a couple of hours on a Saturday or during an evening. Each event needs volunteers to help with whatever activities that event entails. Most of the booth activities are similar to what we do in the classrooms with the Mobile Lab. Speaker events are typically short talks to a general lay audience. Click HERE for the volunteer information form. Please volunteer to impact science education!